We, the adult members of the household, often play a game where we each try to list five good things that happened on a particular day. Usually we can scrounge around and get to five. It’s fun, plus it helps to keep other parts of the day in perspective. 1. PIZZA Friends we haven’t seen in far too long brought over, in addition to their perfect little baby girl, some pizza. 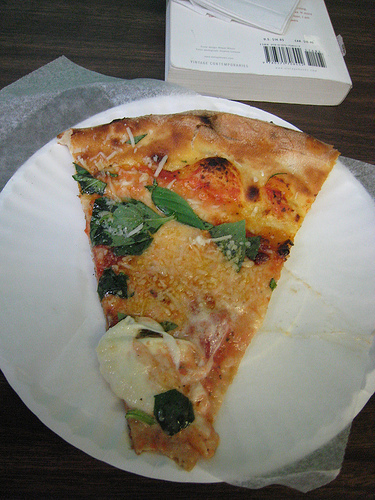 Not just “some pizza,” but one round special and one square pie for lunch from DiFara’s, one of New York’s most famous pizzarias, which happens to be about 3 blocks from our house. Dominick DeMarco is perhaps the most self-actualized being I’ve ever encountered. He was born to make pizza, and he makes the most amazing pizza he can, all the time. At about 70 years old, he works about 363 days of the year, in the unhurried style of a turtle in the sun, with super ingredients. (Why do turtles always get the best ingredients?) When Dom’s checking a pie, he pulls it partway out of the oven without a mitt. When it’s out, he grabs a basil plant and snips leaves right onto the pie. When the health department cites him for these things, New Yorkers try to have the health department shut down. 2. PORCH It was 71 degrees, so lunch was on the porch. I love the porch. We should have the porch be our family crest, instead of a pair of goats backing up and growling at one another, which was my previous suggestion. 3. PINK HELMET We got HAPS a bikeseat, so we needed to get him a helmet. The pickings for people with tiny little heads were slim, and for the most part, boring. The best one was pink and green with monkeys on it. So, we got our son a very expensive, pink, safety-enhancing hat. We’re convinced that he can pull it off, what with his manly bearing and all. No, seriously, he’s a baby, and boys deserve fun colorful stuff. Even his father was adamant that HAPS should have the funnest, with-monkeys helmet possible. 4. PORK CHOPS, BEIJING STYLE After months of sulking inside, we spent most of the first amazing weekend of the year out and about. For dinner we met MORE friends at Lucky 8 in Sunset Park for dinner. It’s a very family friendly, highly delicious Chinese restaurant. Snow peas shoots, deep fried lobster, that caramelized duck, perfect rice, and something new to me: Beijing style pork chops. I’d never tried Beijing pork chops before but my friend Kevin, who is a fake vegetarian, raves wildly about them. We ordered a platter of porkchops. WOW. The baby could instantly tell the difference between the roasted duck with the delicious deep-brown caramelized skin, which he hated the sight of and batted away any time we suggested it to him, and the deep-fried glory of the also brown boneless porkchops, which he tried to commandeer the entire platter of. They’re that really bumpy sort of fried and have a really savory sweet taste, which I think might be Chinese 5 spice. Kevin and the baby went neck and neck for who could eat the most chops. Kevin is a tall guy with a long reach, and he’s got plenty of teeth, so you might think you should put your money on him. Well, HAPS may be small but he’s passionate, and he has great focus. Plus he has a dad who tears pork chops into bits for him, a fact which put Kevin at a definite disadvantage. When ours were gone, HAPS started scanning other tables just to see what they had. You know, just in case. And I’ve never seen him happier than he was afterwards. He even let Kevin carry him around. NO ONE is allowed to carry him around. Perhaps he is hoping the Kevin will be his Beijing pork chops dealer. 5. PEOPLE Lucky to see so many great friends this weekend. Now, I give you a personal challenge: tell me about your five good things from the day. They do not all have to start with the same letter. i know that’s six, but it was that good! I don’t want to talk about my favorite five things. I want some of those pork chops. Alas.